My terrific husband called me up while I was shopping, and asked me to please pick up some "of those good razors" for him. I get him lots of razors for free or pennies a piece, but they start to irritate his face when he has to use them everyday for long periods of time. "Those good razors" he was referring to are the ProGlide razors. As I was looking through the refill cartridges, I realized it would be cheaper per razor to just buy him 5 new razors, rather than the refills. You can get them for just under $6 in the travel section, and there is a $4 coupon you can use. 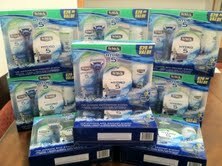 Just as I was leaving the razor aisle, I spotted some Schick Hydro kits that I had almost picked up one time before. The kit is priced at $9.97, and I had a coupon for $4 off any Schick Hydro. I figured $6 wasn't bad for a razor, 5 refills, shaving cream, and a carrying case, which were valued at $20 if purchased separately. It was certainly better than the almost $2 per razor I had in my cart, but I wasn't completely sold because I wasn't sure my sweetie would approve of them. Then lightening struck me!!! 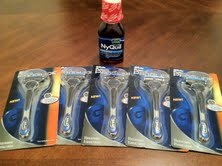 I also had a BOGO on any Schick disposable razor package I could stack with the $4 off coupon. I was able to pay just $5.97 for TWO kits, or right around $3 each. That sealed the deal, and I threw 10 in my cart. However, the $4 off coupon of which I speak is the one that has already expired; bummer! 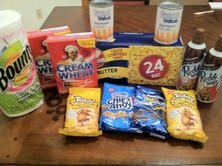 Here's the breakdown of my shopping trip.